Indira Gandhi National Open University December 2018 Term End Examination Results are declared. And, your Marksheet/ Score Card will be sent to your registered home address by post soon. In case you want to download Marksheet Online, then steps given below will surely help you out. IGNOU Marksheet Not Received? IGNOU Marksheet Download Online (Dec 2018-2019), Dispatch Status Sample, Image, Application Form, MPS, Provisional Certificate. First of all, make it clear to yourself that after the publication of result online on IGNOU official website – www.ignou.ac.in. At your registered address of IGNOU, you’ll receive – IGNOU Mark Sheet and IGNOU Provisional Certificate. Now, you may be thinking that after how many days you’ll get them at your home. A clear-cut answer says – “There is no answer to this.” Reason being, in our analysis by My IGNOU Guide Team, we reached the conclusion that for some it reaches within 7-10 days. And, in some rare case, it may take even 9-12 months. Apart from this, you may easily check your IGNOU Mark Sheet Dispatch Status Online. Latest News of IGNOU Hall Ticket June 2019 exam. Besides, you facing doubt about “When will I get IGNOU original degree certificate?” We’ve answered this one as well. You’ll get your degree in the convocation itself. But when is Convocation & when to apply? Don’t worry, get all updates here – IGNOU Convocation 31 2018. Also, if you have not received the certificate, then write concern letter along with form attached with DD in favour of IGNOU, payable at New Delhi at given address in the form. 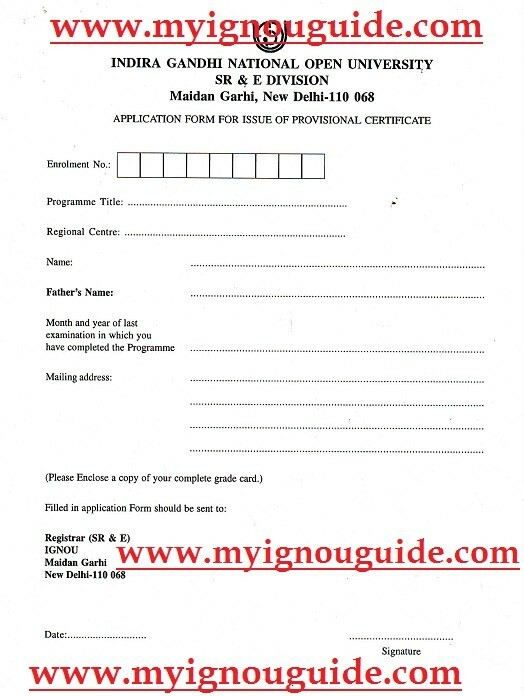 IGNOU Provisional Certificate Application Form is given below. The students have to attend the convocation as well as gather the IGNOU Mark sheet | degree certification in the convocation at the District Centres of the University based on the convenience. The Fees of 2018 Convocation is just to get the original IGNOU degree Marksheet certificate Rs. 400 need to pay via online if you already registered online. If you are applying for the prescribed application fee need to paid by the demand draft IGNOU regional centre. The complete details in relation to Marksheet will accessible in the IGNOU official link and the candidate needs to check out regularly for further updates. Stay in touch with the IGNOU legitimate to get more information. The contestants who are completed their IGNOU course successfully can get the duplicate IGNOU marksheet. You have to make sure the essential way to get without trouble. First, you have to enter into the IGNOU website. The new homepage will show diverse instructions for the candidate convenience. You have to click the link related to get the duplicate marksheet form. The term end option link fetch to get the IGNOU grade card. Now, you can get the form and need to fill up with required applicable details. The required details like name, programme, enrollment number, complete address, month and year of the exam, a centre from where attended for the last examination, bank draft or IP number. Make sure the IGNOU Marksheet fee payment for Indian students Rs. 200, SAARC countries Rs. 400, Non-SAARC $10. The duplicate grade card will be directly sent through the registered post by the IGNOU University. Before, you start to fill the duplicate IGNOU marksheet application form make sure the essential details. You have to carefully note the essential information that you should give in the application form Or for more information – IGNOU Contact. The contenders need to provide the information without wrong details and make sure the Marksheet payment based on your category. Every applicant should have grade system when performing the examination well. It is significant for the candidates to focus on the grade points and ensure to get it from the IGNOU Marksheet authoritative forum. How Does IGNOU issue degree mark sheets? When can I get IGNOU Mark Sheet? How long does the IGNOU take to send a Mark Sheet? How to get a 1st Year Mark Sheet in IGNOU? have been answered. And, this is the right time for you to know about new changes in IGNOU in 2018. If you’re holding any questions regarding IGNOU Marksheet Download Online (Dec 2018-2019), Dispatch Status, do let us know in the comment box below. I am p.elavarasi . My enrollment number is 158101910.i finished my ma education term end examination in December 2017 and my Viva in December 2018. I haven’t received any certificate or marksheet till now . Please do consider my request and do me favour soon. Waiting for your reply. I am Nitesh Kumar,I have completed my MARD in Dec 2018 but not received provisional certificate and Marksheet till now. My enrollment no. is 167484840. Sir please update the same…. For LIVE status, please visit your regional centre and ask the staff out there. My name is prabhjit Kaur and enrollment no is 169662232(MEG) still I didn’t get marksheet. Please send me soon my provisional certificate etc..
My name is Rajeev Ranjan bhardwaj ….and my enrolment no is 157085418.and I am also one of the stendent who didn’t get marksheet and provisional and kindly requested you to send marksheet and provisional…..and one issue is that how to track our status give me solution asap!! For LIVE status of your marksheet or DMC, you will have to visit your regional centre. I completed BA (lateral entry Gyandeep) through the same on TEE Dec 2018 but provisional certificate and Marksheet also not received till date.. This problem is common for all, please visit your regional centre for LIVE update. My name is Hema and my enrollment number is 150279835 .My result has published in February this year,unfortunately I didn’t get my marksheet till now,but all of my friends have received their marksheet.I have visited many times in regional center but they didn’t give me right information,i request to you please provide me my marksheet dispatch number,with the help of this I can get information about marksheet status. My name is Gopi Marvaniya and my enrollment number is 127194366.i have complete MCA (June 2018) ,unfortunately I didn’t get my marksheet till now,but all of my friends have received their marksheet.I have send EMAIL in regional center delhi([email protected]) but they didn’t Reply,i request to you please provide me my marksheet dispatch number,with the help of this I can get information about marksheet status. Getting Marksheet from IGNOU on right time is more a luck factor nowadays. I request you to manually visit your regional centre and ask staff out there for the LIVE Status. Sir my marksheet and provisional certificate return back to ignou Delhi due to address change. How can get my marksheet and provisional certificate in my new address. To get it re-dispatched, you will have to visit your regional centre and ask the staff out there for the procedure. I am MA (MSO) student. My Enrollment no. is 158277399. My name is Rajani Kant Singh. My result is declaire; But my marksheet not avliable. Please send my marksheet dispatch status. My name is BHAVNA and my enrollment number is 170111190 .My result has published in SEP 2018 ,unfortunately I didn’t get my marksheet till now,but all of my friends have received their marksheet.I have GRIEVANCE many times in regional center but they didn’t give me right information,i request to you please provide me my marksheet dispatch number,with the help of this I can get information about marksheet status. Hi, my name is PINKI. I have two requests. One is , my name spelling on grade card is showing PI NKY instead of my correct name PINKI. What will be printed on my marksheet? This mistake happened at the time of registration, but , I corrected it after one week and it is also updated on online portal. Dsiidc wine shop , okhla industrial area, Delhi ,110020. My name is Rahul and my enrollment number is 161133271 .My result has published in February this year,unfortunately I didn’t get my marksheet till now,but all of my friends have received their marksheet.I have visited many times in regional center but they didn’t give me right information,i request to you please provide me my marksheet dispatch number,with the help of this I can get information about marksheet status. It is not possible to get Marksheet Dispatch Number online. Just visit your regional centre and find a possible solution. Your marksheet will be reached to you shortly. Please wait. can you tell me what is the process…. Your Marksheet for MCA will be reached to your registered home address soon. Marksheet will be reached to you shortly. Also, give a visit to your registered post office for the update. I had given my final exam in December 2018 and my grade card is complete now. IS THERE ANY WAY TO KNOW MARKSHEET PRINT DATE AND PERCENTAGE BEFORE 22ND MARCH SO THAT I CAN FILL FOR LIC AAO.I CONTACTED REGIONAL CENTRE THEY TOLD NO OPTION THEN TO WAIT.However I had read on quora that regional director can provide temporary result but when I told this at regional centre they denied.Then I contacted on ignou maidan garhi results department on call .They picked up the call twice out of 94 times and told me to wait then disconnected.If u can help me or if u re from Delhi,please help me. Really there is no other option then to wait. Do you have a City Address or Town Address? Because in rural areas, postal documents don’t reach on time. We understand that you need your marksheet urgently. But as a part of the solution, please visit your regional centre and latest and live updates. Please visit your regional centre. I am MHD student. My enrolment no. is 165058049. My name is Subhrakanta Padhan. My result is declaire. but my marksheet not avliable. Please send my marksheet dispatch status. Marksheet Dispatch Status can be checked online. Hlo sir……today the rank of b.ed released….and my rank is 427…..m from odisha…..plz tell me about the selection procedure ?? I completed M.A. in December 2017 exam, accordingly I had received the provisional certificate and Marksheet by post in April 2018. As it is known that the original certificate is issued after the subsequent convocation i.e. 32nd will be held in due time. In this context, I want to know that, is the registration to attend in the convocation essential? if not registered for convocation, will the original certificate be sent to concern Regional centre? or is registration compulsory to get the certificate whether anyone presents in the convocation or not? My earnest request please reply to me, I shall be waiting for your reply. Thank you. Sir my enrollment no is 143090071 with BDP I completed my degree in June 17. I didn’t received my mark sheet and certificate till date. Where and how can I get the same. Please report your problem to IGNOU Headquarters, New Delhi. In this case, you will have to physically visit your Regional Centre. Ask the staff there what happened to the live status of your Assignment Marks and Grade Card Status update. Also, tell them about the problem you’re currently facing with your marksheet. I have completed my masters degree from ignou Ranchi in 2015. Sir, I want my original degree certificate through speed post at my postal address. Plz tell me any procedure. its urgent. The complete procedure of obtaining the Marksheet is already available on this page. Please read the step by step guide available on this page clearly. Sir,i have completed my b.com course from ignou last year .but still I haven’t got my original market .pls tell me sir when will I get my original marksheet. Like you, hundreds of other IGNOU students haven’t got their Original Degree Marksheet in hand. This is where the problem exists. You’re kindly requested to please visit your Regional Centre and ask them for the status. You’re in Delhi right now? Correct? Thus, you must lodge a complaint against RC Bhubaneswar. Hopefully, you can’t get there. They people don’t pick up the phone deliberately. I have completed my masters degree from ignou Agartala in 2018,may I please know when will I get provisional degree certificate. Your provisional Certificate will soon be sent to your registered address. Please wait. have you visited your Regional Centre? Ask them for the realtime status? Sir i have completed MA in MSO, in june, 2018. Till today i haven’t get my provisional certificate and mark sheet. Plz tell how can i get it soon? If i have to fill up form, do i need to fill up separately for provisonal certificate and for mark sheet? What is the amount i need to submit for each of them? First of all, you must visit your respective Regional Centre of IGNOU and ask the staff there about your MarkSheet dispatch status. I have completed my MAH- ( M.A in History) in June 2018 TEE. For applying job( Graduate Teacher) I am great need urgent my marksheet and provisional certificate.Please take care and send my address. Respected sir i have completed my MPS- Master in Political Science in June 2018 TEE. when should i expect my provisional certificate and mark sheet as its urgent and its late . I need to produce it to some authority. Sir i have completed my graduation during 2016. MY enrolment no is 140664174. I have also paid fee for convocation ( RS 600/-). However, i have not received my original degree certificate. My contact no is 8717030576. Pl intimate me present status. Respected sir i have completed my MA- clinical psychology in June 2018 TEE. when should i expect my provisional certificate and mark sheet as its urgent and its late . I need to produce it to some authority. Sir, I have completed my BA final year 2018,My Enrolment No is 158465363.I have not received my BA Mark Sheet.Should I apply for duplicate Mark Sheet or should be wait. Sir, I’m student of MSO bearing roll NO 150608774. I have cleared my exams on DEC 2016. But till now I have not received my marksheet and certificates when I inquired in the regional centre they said that it has been dispatched from Delhi but has not reached me nor has not returned back to Delhi. So I told them if they could get me the barcode no of the speed post I can verify it from post office as they are ready to help. So sir please help to sort out this problem. Sir, i completed my B.sc grade card on 24-oct 2018, but have not received marks sheet till date .Should i wait or should i fill application form for duplicate marks sheet. Hello sir I am altab Ahmed and I have completed my post graduate diploma in disaster management for the sessionjune 2017 and the TTE was held in the month of June 2018. My result was declare in the month of September 2018. My friend has got the mark sheet of the same course. I am still waiting for my mark sheet. Please reply me if necessary. Your marksheet will be sent to you shortly. Please wait. Sir, I’m student of MAEdu bearing roll no 147948444. I have cleared my exams on March 2017. But till now I have not received my marksheet and certificates when I inquired in the regional centre they said that it has been dispatched from Delhi but has not reached me nor has not returned back to Delhi. So I told them if they could get me the barcode no of the speed post I can verify it from post office as they are ready to help. So sir please help to sort out this problem. With regards I want to say that I haven’t received my Marks Card till now. I approached to your office time and again but till now there is no response from your side. I have submitted an application along with format for dublicate as directed by the worthy director RC Srinagar on 30 jul 2018. I have passed BDP three years degree course in December 2017. Please send my marks card at an earliest so that I may not suffer. Sir , I m Sandeep Singh . I have completed my BA in June 2017 but not received provisional certificate and degree till now. My enrollment no. is 148318269. Sir please update the same…. Sir , my name is umashankar sharma , roll no. 141648742 , I have complete my bdp in 2018 and I have not received my marksheet till now . I have completed my MA in 2017 and I have not received my marsheet till now. Perhaps due to change in address pls suggest me how I get my marsheet. Thanking you my Roll no 152521507. I have given exam for mca in December 2017 and result has come in 2018..but i hav not got marksheet yet. Your Marksheet will reach out to you ASAP. Please wait. I have completed my Post Graduation (MA in Public Administration) during DEC,2017. My complete result has already been declared on 08th DEC, 2018. Please tell me when I’ll receive my Marksheet and Grade card. I have completed my Post Graduation (BDP PROGRAMME) during DEC,2017. My complete result has already been declared . Please tell me when I’ll receive my Mark sheet and Grade card. I am Tsering Angchok student of Institute . I have completed my BTS from your department Ignou. Know i am in need of my Marksheet to apply for further studies. As my enrollment no is 145830881 kindly make necessary arrangement to get my marksheet as the earliest. sir, I completed my MEG Degree in 2017-June. but I have not been issued my Orginal degree. I request you to despatch my ORIGINAL DEGREE. My Enrollment number: 127152946. I have completed my post graduation ( M A in History) during December 2017. My complete result has been already declared on 20 feb 2018. Please sir tell me when I will recieve my marks sheet and grade card. Good evening i am the student of I.G.N.O.U i have cleared my exam in 2017 still i didn’t get my marks sheet. I need to do admission in Mttm so kindly as soon as possible i need my marks card. Good evening i am the student of I.G.N.O.U i have cleared my exam in 2017 still i didn’t get my duplicate marks sheet. I need to do admission in Mttm so kindly as soon as possible i need my marks card. sir i got my dublicate marksheet from ignou as my original marksheet got returned to headquater because of my incomplete postal address. plz tell me how can i apply for provisional certificate also? and will i receive my original marksheet in convication? I have completed my bhm course after giving exams previous December but I am still awaiting for my marksheet and provisional certificates. Kindly inform to me how and up to when will I be getting my certificates? Apart how can I get them at the earliest? You’ll have to have a visit at your regional center ASAP. Because, as of now, December TEE Marksheet should have been reached to you possibly. First of all thank-you for replying to my query. Sir on my part I am trying my best to get my marksheet but in case if I m unable to then?because officials at my regional centre are clueless about my marksheet and I have got no relevant information from them. I am on my way to the post office now to check . Does ignou issue duplicate marksheet and provisional certificate?Kindly notify it will be of immense help. Hello IGNOU issues Duplicate Marksheet and Provisional Certificates, no doubt. Now, only way remaining is to visit your regional centre as soon as possible and ask them for the status. Hi my name is charan kamal singh i have competed my BDP course in 2014 and in one of my subject assignment marks are not showing but theory marks are there ,and its still showing not completed ,i have visited my regional centre several times but they are not helping me out , i have shown all the relevant documents but no use , so please guide me what to do and how to get my complete certificates.. If people at your regional centers are not helping you out. Then, you seriously need to complain to head authorities in New Delhi. Only Head Officials will be able to look after this matter. Hi my name is Susan enrollment no. 906173904, I have completed my exams and submitted all my assignments in 2013, but still my grade sheet is showing incomplete in one subject as per ignou I have not submitted my one assignment thats is feg-1, but this is not true I have submitted my all assignments and i also been to my college several times and showed them the feg-1 assignment slip. Ignou pleases guide what to do to get my pass marksheet asap. Can we know your IGNOU Regional Centre/ Study Centre Name? My name is Harjinder singh. I have completed BA in dec 2017 (Gyandeep). I didn’t get marks sheet. Plz issue me as early as possible. As of now, your mark sheet should have reached your home. If you don’t receive it soon, make sure to get it by manually visiting your IGNOU Regional Centre. i would like to inform that i have passed BA MY ENROLLMENT 110294524 . I PASSED IN DECEMBER 2017. BUT STILL I HAVE NOT RECEIVED MARKS SHEET STILL . It’s too late as of now. All you need to do is just visit your Regional Centre and report a complaint regarding this there. I have completed my Post Graduation (MA in History) during Dec,2017. My complete result has already been declared on 27th April, 2018. Please tell me when I’ll receive my Mark-sheet and Grade card. my enrollment no. 163075659. Releasing Mark Sheet is all in the hands of your Regional Centre. Thus, we recommend you to visit your Study Centre. And, ask them for Mark Sheet statement now. not deliver by post my home address. Then, make sure to contact your regional address right now. DIST-SIWAN, STATE-BIHAR, PIN-841226) please sir send my marksheet l will always gratitude of u .
You’re requested to please visit your Regional Centre Physically. Over there, ask the authorities about the status of Mark Sheet. Sir, I have completed my B.COM from IGNOU in June & Dec 2017 session. Final grage Card alongwith certificate for the same has not been received by me so far. You are requested to fwd the same at the earliest, if not forwarded. My enrollment No is – A21701040. An early action / positive reply is requested plz. Sir completed my MASTERS in English in june 2017…result declared in september…but i havent recieved my markssheet yet…may you please guide me what should i do…..
Sir I cleared my all papers of MAH in Dec 2017. Problem is my registered address because presently I am at Lucknow and address is in Karnataka. How can I get my marksheet at my present address. Please guide me. I have completed my MAH (History) during December,2016. My complete result has already been declared March 2017. Please tell me when I’ll receive my Marksheet / Grade card and degree certificate. I called regional centre for marksheet and degree but they said that regional centre is not concerned about that . I have completed my m.a.education in July 2017 but still no certificate of any kind. Plz tell me necessary information and procedures to get them on time. I have completed my B. Tech. (CIM) during June,2017. My complete result has already been declared August 2017. Please tell me when I’ll receive my Marksheet / Grade card and degree certificate. After how many days,IGNOU will start dispatching the provisional certificate. As yesterday on 6th Feb.,2018 my BDP results are cleared and are showing completed for all papers. My hometown is in Imphal,Manipur. As i am in great needs of the provisional certificate for my job promotion, i am very eager to know the amount of time taken for receiving the certificates. I have received my marks card but my name is incorrect on that also I have completed my pg in mcom but on marks card some of the assignments are not updated so tell me what to do. Sir, I have completed my MPS course in june 2017 but till now I do not receive my marksheet .what can I do sir? After publishing the result, till date I have not received my mark sheet what should I do now. I am Mool Chand , complete BA in Jun 17 .when postman came to my house to deliver the marksheet my house was locked and he return the same .now what I should do to receive tha marksheet. sir am complete my BA june 2017 but till now am not receive my marksheet . Please, send us the dispatch status of my marksheet and provisional certificate.my enrollment no is 143020541 and program code is BA. I Sanjay Kumar Singh Enrolment no-145218756.I have complete my master inMPS session2014-16.But I have not received marksheet.please update me. It’s a long time since you’ve completed your masters. Following some postal services, you mark sheet may haven’t reached you. Make sure to be a part of IGNOU 31st Convocation to get mark sheet from there. Thanks. im vivek kumar.i have done my bhm from ihm hamirpur h.p. in 2015.Bt still not get my marksheet.My roll no. is 128321945. Please help me to get my marksheet.Its good for my future. that if you don’t get marksheet within precise time. The only solution you’re left with is to visit your Regional Center and ask them for live status of Marksheet. I have completed my Meg June 2017. my roll no is 158272382 till now I have not received my marksheet and provisional certificate. please tell me when I will get. I also want to know how can I check dispatched status of my marksheet and provisional certificate. If still your Marksheet is not reached, all you need to do is just visit your respective regional centre as soon as possible. And, as them for a status. See, Regional Centres never keep mark sheets with them voluntarily. They dispatch them as soon as possible. If in case, if an applicant remains vacant from getting his/ her marksheet, then the only solution is to visit your respective RC. And to follow what RC has told. Congrats on your completion of Masters in Public Administration. Generally, within 7-10 days of the result, marksheet is received. But if you haven’t received you may get it at the time of convocation. Or, if you want right now, fill the form above and submit. ? Ignou guide maine july 2017 me pass kia BA par ab tak provisional v nahi mila…maine form v varkar vej dia ….ab mujhe kab milega? You’re requested to please visit your regional center. Narrate this whole information to them, and ask for status. I have completed my Post Graduation (MA in Public Administration) during June,2017. My complete result has already been declared on 08th September, 2017. Please tell me when I’ll receive my Marksheet and Grade card. Until 8th September 2017, it should have been reached to your registered address. But, if not received till date, just fill the form above and submit or just get it at the time of convocation just 3 months later.? I am MLIS student. My enrolment no. is 166169745. My name is Rahul Aggarwal. My result is declaire. but my marksheet not avliable. Please send my marksheet dispatch status. my contact no. is 7983635436.
but still i am waiting for my marksheet / proviosional certificate. What is the problem for delay?? Keep waiting. Marksheet reaching late to students is a problem with everyone enrolled in Indira Gandhi National Open University.